VASTING ART stand by our first-class quality and strive to make our paintings as original paintings nature of the artwork.Frames and canvas are as same as the ones used in museum,the surface is covered with clear plastic film layer to protect the oil paintings.the quality of all frames are closely supervised and guaranteed. The artwork made by really experienced artists who have more than 10 years painting experience. The panel has already perfectly stretched and framed with hooks mounted on the wooden bar for easy hanging out of box. Please notice that there might be slightly differences between product image and actual artwork due to pixel differences, different brand of monitors and lighting. Please feel free to contact us if you have any problem and we aim to provide you a perfect shopping experience. 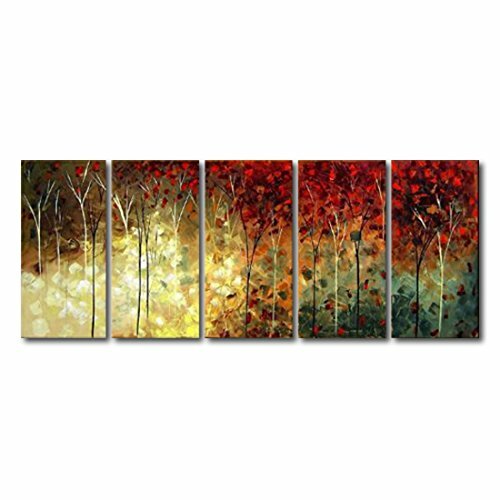 100% hand-painted oil painting artwork are wrapped and stretched with wooden frame, hooks are mounted on the back of wooden bar on each panel for easy hanging out of box. Package: all oil painting are strictly observed by experienced QC before being shipped and according to packaging standards to avoid any possible damage during the shipping process. Paintings stored in Amazon warehouse in US can be quickyly delivered to your hand without delay. If you have any questions about this product by VASTING ART, contact us by completing and submitting the form below. If you are looking for a specif part number, please include it with your message.